The last Inside Islam radio show examined Islamic Feminism. The two guests, Sumbul Ali-Karamali and Areej Zufari, talked about the global movement where Muslim women are going back to the Qur’an to assert their rights. In other words, they are calling for a re-reading of the Qur’an that reflects its true attitude towards the plight of women, where both women and men are addressed by God as human beings. Both Ali-Karamali and Zufari highlighted that what was interesting about this new movement is how inclusive it is and how women’s voices are central to the project. One of the stereotypes about Islam is that it is oppressive towards women. This idea assumes that Muslim women are not given the choice to live their lives as active members of the society, and are restricted by numerous oppressive practices that stem from the faith. This is juxtaposed with a view of Western societies using liberal ideals and freedoms to elevate women by giving them choice. These two notions are both true and false on some level. The discussion on the radio program underscored the fact that Islam, as a faith, is not fundamentally the problem; rather, it is Muslim–oftentimes male–interpretations of the faith that have led to the problematic understandings of Islam that we sometimes see today. So, yes, there are oppressive representations of Islam, but the faith itself is not the problem. On the other hand, while it is certainly true that women in Western societies have advanced significantly, we cannot assume that all women in the society have the same rights to choose how they live their lives. 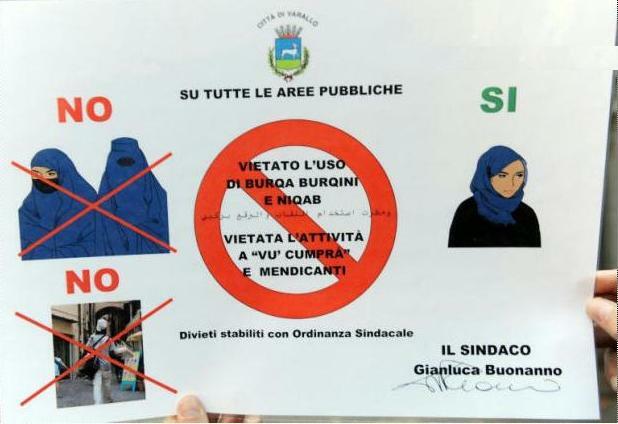 One example that illustrates that this is not true and is a constant topic of discussion is the obsession in Europe with banning the niqab and burqa. It is interesting that liberal ideals of tolerance and freedom are employed to prevent women, especially if they choose to wear the niqab and burqa, from expressing their commitment to their faith. So, in this case, they shouldn’t be given the right as members of the society to choose and that is not considered to be oppressive? The most recent manifestation of this debate took place in Belgium where a vote last month put it on track to become the first European country to ban both the niqab and burqa in public spaces. Women who appear in public wearing either could face a fine or seven days in prison. How is that not oppressive? There are women who choose to wear the niqab and are willing to undergo any security checks that are required. Why should they be prevented from taking part in their societies because of a religious belief, especially when there is supposed to be protection of freedom of expression? There is a real fear among Muslims that this trend will spread to other countries and that it reflects an anti-Islam attitude. What the show and stories like this underscore is that Muslim women continue to face challenges everywhere to determine their own relationship to Islam. Whether or not a Muslim woman chooses to wear hijab, niqab, burqa, or any form of attire, it should remain her choice. Everyone needs to stop talking about Muslim women and let them speak for themselves. What do you think about Islamic feminism? Do you think a women should not be allowed to wear a niqab or burqa if it is their choice? Is there a difference between Muslim men and European politicians telling Muslim women how they should dress? Does this kind of ban go against freedom of expression? Please share your thoughts below. This entry was posted in Europe, Gender, Sharia and tagged #SSRCWCG, France, Islamic Feminism, Veil by Reem. Bookmark the permalink. I don’t believe there is any called “Islamic” feminism. Islam is way older than the western feminism and, although there is an overlap between the western feminism movement and Islam stand regarding women rights, there is still a gap between the two. The new term of “Islamic” feminism has risen from Muslim activists who are for one reason or another are affected by the western feminism. I would call the Muslim women movement for women rights is “returning to Islam” movement”. In many areas of the world, the Islam principles and teachings have been kidnapped by male-dominated cultures and to succeed in that, some needed to decline the Quranic verses or to deform the meaning of these verses. I believe it so important for the Muslim women movement not to be trapped by extremism, with both the male-dominated cultures and western feminism in both ends. It is always difficult to get knowledgeable people with this issue, but nevertheless, you understand exactly what you are posting about! I appreciate it!